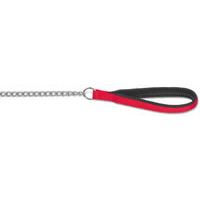 The Nylon Chain Dog Leads are manufactured using high quality chrome plated mild steel that is extremely tough and soft nylon webbing that is padded, used in the handle of the dog lead, for extra comfort for your hands, when exercising your dog. 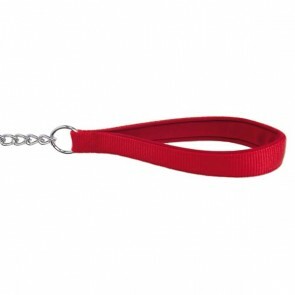 The padded handle of the nylon and chain dog lead, is not a gimmick, it really is beneficial for the comfort of owner's the hands, especially if you have a large or heavy dog that likes to pull on the lead. Many owners will find that using a padded nylon chain dog lead, instead of a traditional leather or rope lead makes walking more enjoyable for both owner and dog, when you have energetic or enthusiastic dog that just wants to get to the park as quickly as possible! Millions of tiny air pockets in the handle of the nylon chain dog lead, act as a cosseting cushion in the palm of your hand, helping you to manage the pulling behaviour of your dog on the lead more comfortably. Lastly each chain link of the dog lead is welded, an essential feature when selecting a strong reliable nylon chain dog lead that will be durable! Also available on this website are Dog Collar & Lead Kits which include a Nylon Paw Reflective Padded Lead and Collar + FREE Flashing Tag, with Light Sensor. We also stock Leather and Chain Dog Leads in various sizes, suitable for most breeds. Nylon & Chain Leads: 5 stars out of 5 based on 0 user reviews.